Elizabethan Staffordshire saucer in blooming berry bushes design made in England. 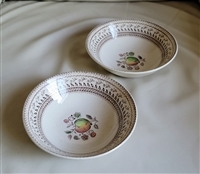 MYOTT Staffordshire FH 2909 saucer. Royal York by Myott Staffordshire Bread & Butter Plate. MYOTT Staffordshire FH 2909 dessert/pie plate. MYOTT Staffordshire FH 2909 bread and butter plate. Staffordshire Demi-tasse Rose cup, England. English Ironstone Beacon Hill by British Anchor Staffordshire. Bread and butter plate from Staffordshire, England, in Liberty Blue pattern. Staffordshire fruit/desert bowl in Liberty Blue pattern. Saucer in Chelsea Rose-Multicolor by Royal Staffordshire. Staffordshire teacup and saucer in Liberty Blue pattern. Yorkshire multicolor porcelain dinner plate by Staffordshire, England. Staffordshire "Old Granite" fruit sampler by Johnson Brothers, England. Royal Swan Historic Castles dinner plate. Crown Staffordshire Floral green vase. Yorkshire multicolor by Staffordshire creamer and teacup, English vintage porcelain. Staffordshire ironstone 14 inch oval serving plates Blossomtime Blue pattern. Yorkshire by Staffordshire Ironstone creamer and gravy boat. Staffordshire Hanley Falconware The Pilgrim Fathers plate. Liberty Blue Staffordshire Historic Colonial Scenes Fraunces Tavern serving bowl. Elizabethan Staffordshire English drinking tea, coffee cups mugs in floral design English garden in set of 4. MYOTT Staffordshire FH2909 dinner plate. Liberty Blue Staffordshire Historic Colonial Scenes 1/4 lb covered butter. Liberty Blue by STAFFORDSHIRE set of 33 items including teapot.